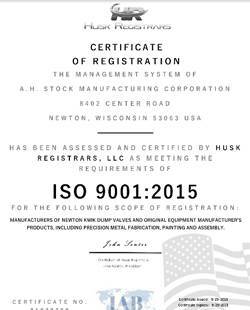 AH Stock Manufacturing is Proud to be an ISO 9001:2015 Certified Manufacturer of Newton Kwik Dump Valves and Original Equipment Manufacturers Products, Including Precision Metal Fabrication, Painting and Assembly. In March of 2013, A.H. Stock Manufacturing Corp. became certified in meeting the requirements of ISO 9001:2008 as Manufacturers of Newton Kwik Dump Valves and Original Equipment Manufacturers Products, Including Precision Metal Fabrication, Painting and Assembly. This means that our company maintains a management system to the required standard and to conditions and schedules established by Verisys Registras (IAB Accreditation #7C558984).